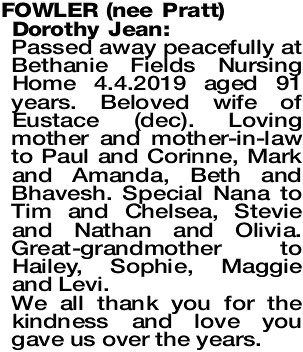 Passed away peacefully at Bethanie Fields Nursing Home 4.4.2019 aged 91 years. Beloved wife of Eustace (dec). Loving mother and mother-in-law to Paul and Corinne, Mark and Amanda, Beth and Bhavesh. Special Nana to Tim and Chelsea, Stevie and Nathan and Olivia. Great-grandmother to Hailey, Sophie, Maggie and Levi. We all thank you for the kindness and love you gave us over the years. 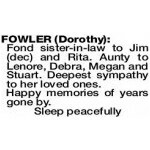 The Funeral Service for the late Mrs Dorothy Jean Fowler (nee Pratt) of Dardanup will be held at the D ARDANUP Cemetery commencing at 11.00am on MONDAY (15.4.2019). The cortege will leave 6 Little St, Dardanup at 10.50am. Sorry for your loss she was a beautiful lady. 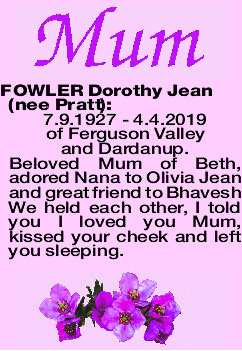 We held each other, I told you I loved you Mum, kissed your cheek and left you sleeping. 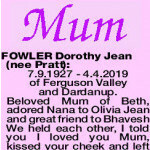 FOWLER DOROTHY Fond sister-in-law to Jim (dec) and Rita. Aunty to Lenore, Debra, Megan and Stuart. Deepest sympathy to her loved ones. Happy memories of years gone by.